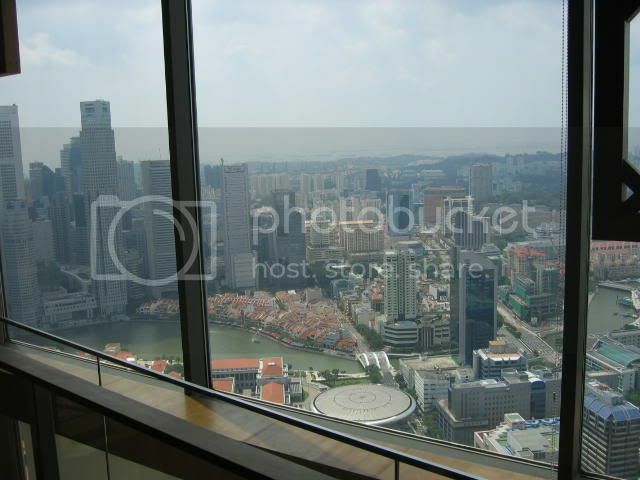 Ah, the imposing Singapore skyline, a truly inspiring sight on a Sunday afternoon. 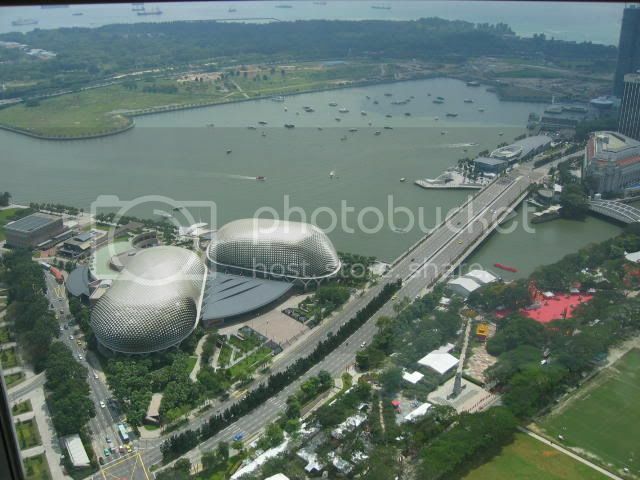 My mother and I had Sunday brunch at the Equinox, a restaurant situated on the 70th floor of Raffles City, offering stunning panoramas of our entire city-state. We were fortunate enough to obtain a window seat overlooking the marina and the Esplanade, and I think it cannot be denied that with stunning views like these, the ambience factor of the dining experience is greatly enhanced. 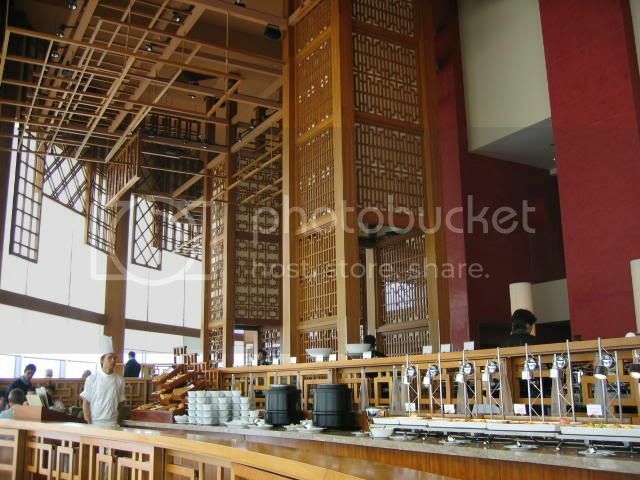 The actual restaurant is rather oriental, with a lot of vermillion and wooden trellises. 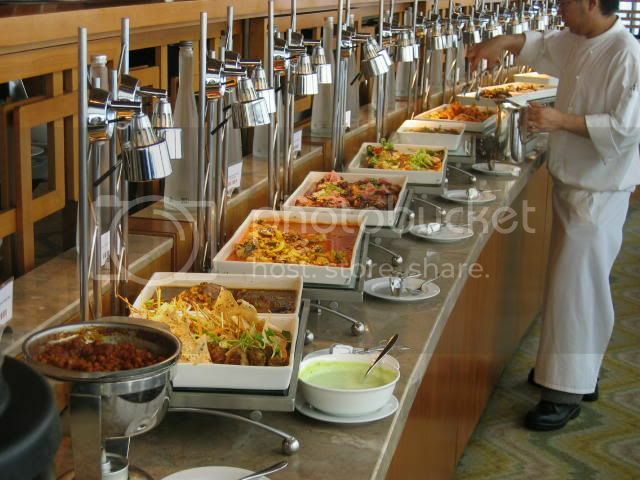 Brunch is served in the form of an international buffet, and there is a very impressive spread encompassing the usual pasta and roast stations, as well as the more exotic saute stations for foie gras and seafood salad. 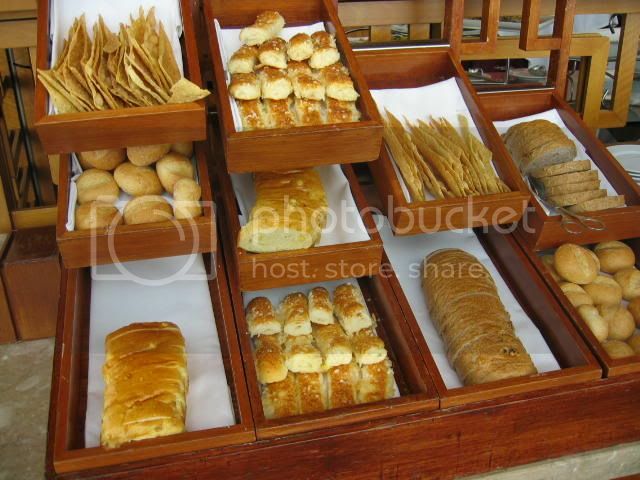 Lots of bread, but somehow none of them looked very appetising to me. The rolls, in particular, seemed extremely hard, so I decided to have my French onion soup without bread. It would have filled me up too much anyway. The French onion soup was pretty good though. 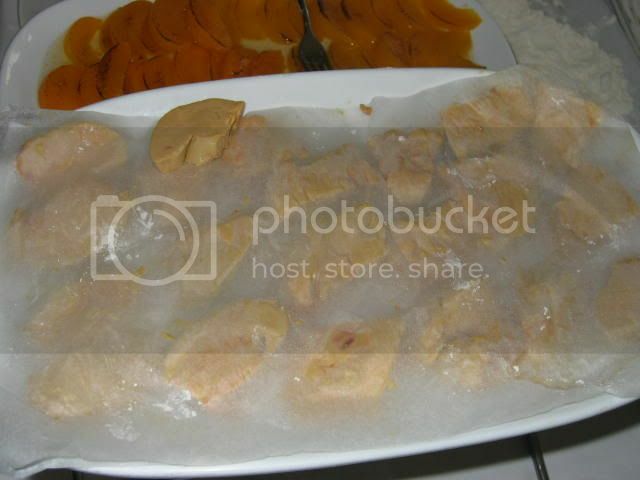 The highlight of the buffet probably has to be the foie gras station, with numerous pieces of liver laid out to dry, just begging to be eaten. The livers are pan-fried and served with a croute and a slice of caramelised peach. 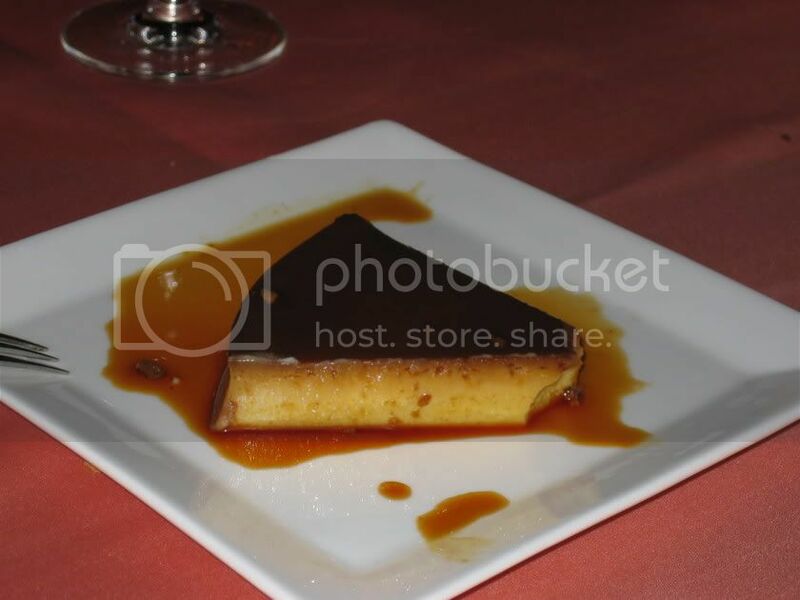 I was fairly impressed by the chef's ability to handle such miniature slices of foie, without completely disintegrating them into puddles of oil. 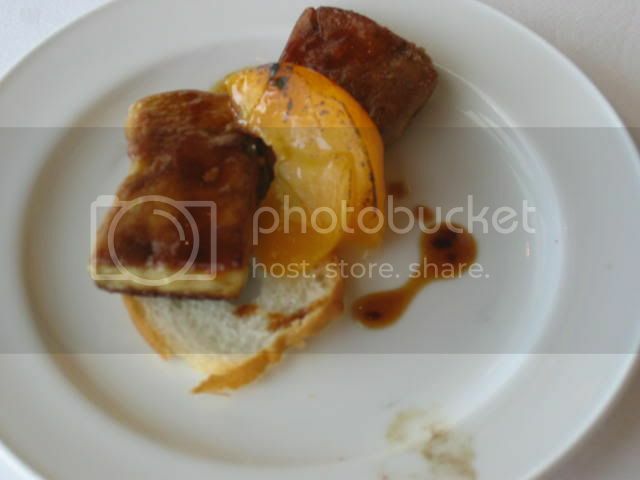 The foie gras is excellent - slippery, rich and oily, and I could probably have polished off the entire station, but I wanted to try the rest of the buffet too. 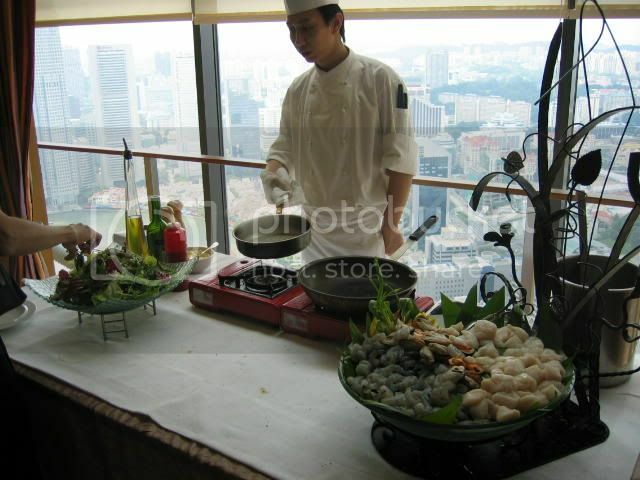 There was another saute station serving seafood salad; here you can see fresh prawns and scallops waiting to be cooked and slathered with mayonnaise. Decided to give this a miss, in favour of the Japanese appetisers on offer. I'm not a great fan of Japanese food, but I do think they make for excellent appetisers. 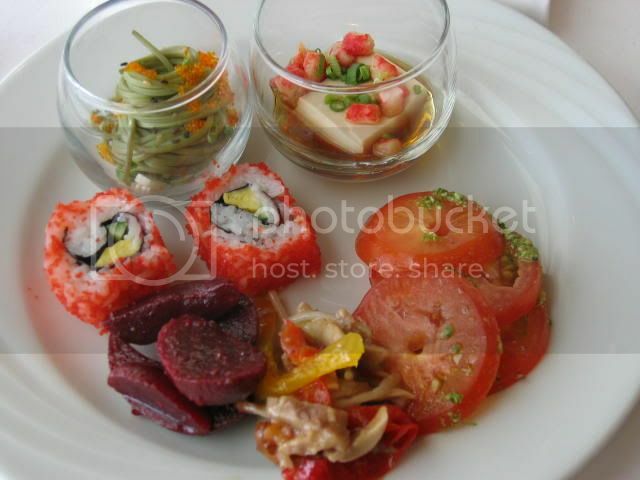 Clockwise from top left: soba served with tobiko and spring onions, tofu cube with shrimp served with a mirin-shoyu sauce, tomato salad, roast duck salad, beet root salad and california maki. I've an idea budding of incorporating some of these into my next dinner. 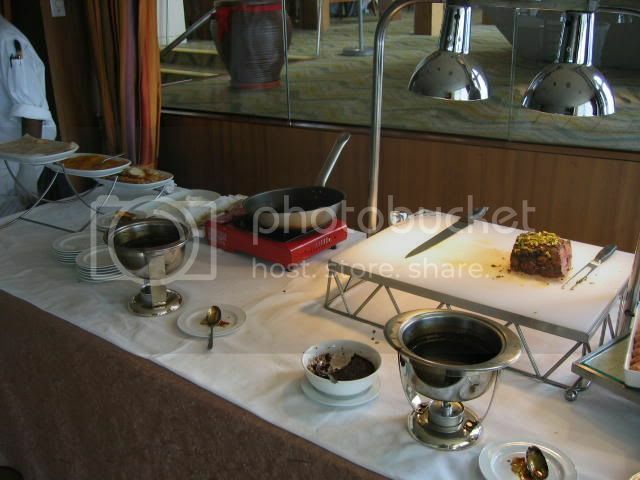 The main buffet is an assortment of meats and vegetables, cooked in various ways. There were braised beef shanks, roasted lamb legs, teriyaki chickens, roasted potato wedges and kebabs. 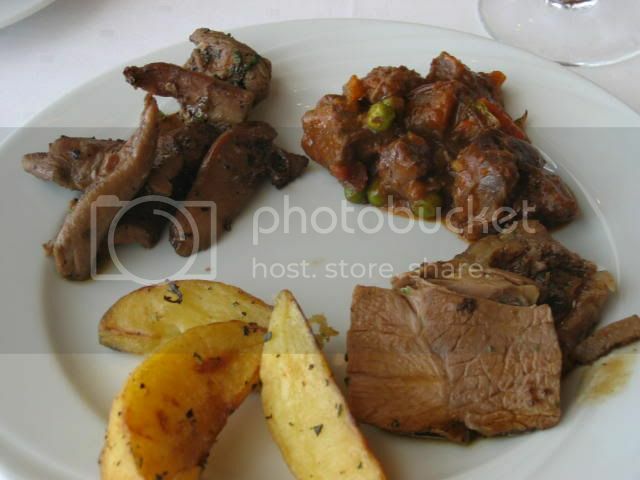 Clockwise from top left: Duck breast, braised beef shank, roast lamb leg, roasted potatoes. Nothing to write home about, as some of the meats were a bit dry, but I did like the roasted potatoes, which were flaky on the inside but have a bit of texture without. I headed back to the saute station, not for more foie gras (though I was sorely tempted), but for the roast beef next to it. The roast beef wasn't particularly awe-inspiring, being somewhat on the small side, but by that time I was feeling rather filled up. 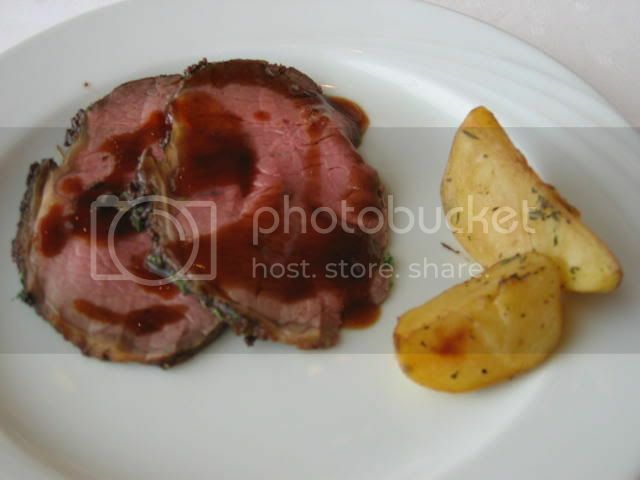 A nice helping of dark sauce and more of those roasted potatoes are just what this beef needs. The dessert spread at the Equinox is pretty good, including panna cotta, bread puddings, and most importantly, a chocolate fountain. Unfortunately, it's not as good as it looks - the panna cotta wasn't set at all, and just puddled into unappetising creaminess. 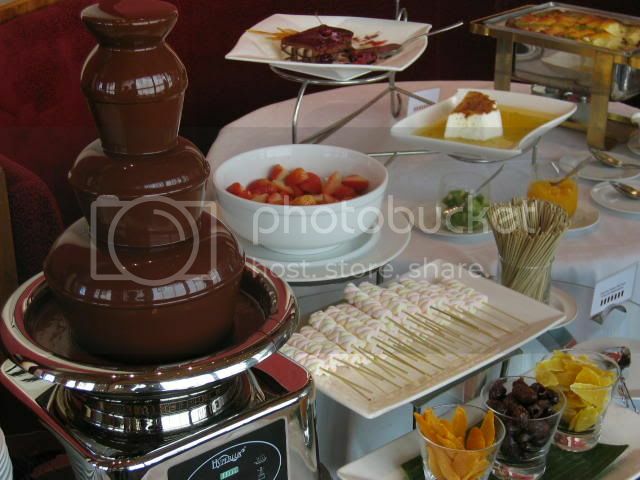 No complaints with the chocolate fountain though. 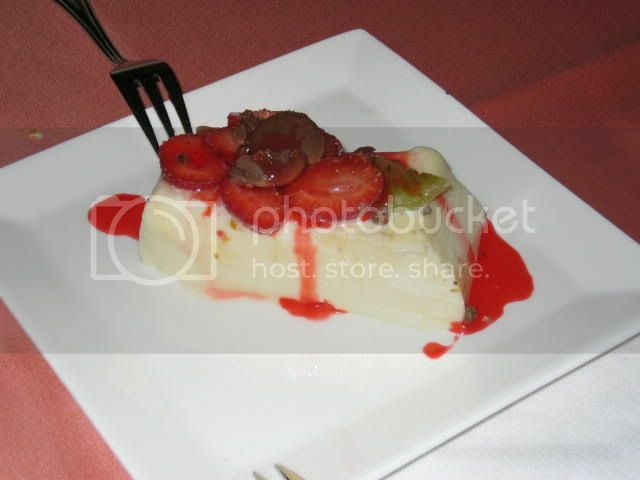 As extensive as the dessert buffet was, I didn't get the chance to try most of it, since I was feeling rather full. 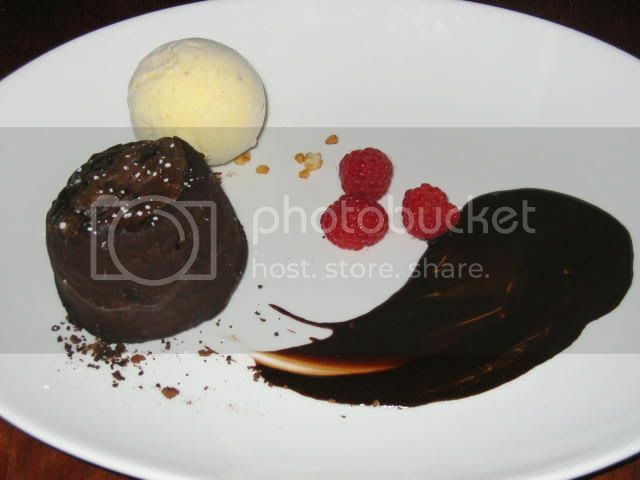 Equinox is located in the heart of Raffles City, so getting there is a piece of cake. Ambience, as I've said, is pretty phenomenal, though I suppose on a rainy day there isn't much of a view to talk about. Being a buffet, service isn't fantastic, but I suppose it's adequate. The biggest drawback though, is undoubtedly the price. For Sunday brunch, it's $75 per person, without alcohol. With alcohol, it's $90. Rough doesn't even begin to describe it; criminal is more appropriate. Thankfully, my mother had a Feed at Raffles card that let us dine at half the price. Apparently, during weekdays, the price goes down to $40, but the amount of food isn't as generous. I love the weekends; they're such a perfect excuse for stuffing yourself like a turkey. Assuming turkeys voluntarily stuffed themselves, of course. So I celebrated a birthday dinner on Saturday at Sebastien's, which turned out to be an excellent experience, in no small part due to the good company and the munificence of my gracious host, who spared no expense with food and wine. I thank you most gratefully indeed. 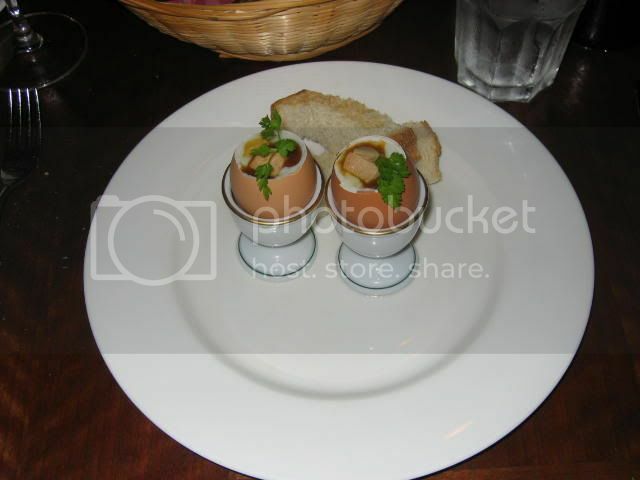 An unique appetiser was arranged for just this occasion, soft-boiled eggs re-imagined as haute cuisine, with the addition of sublime cubes of foie gras, aromatic black truffle oil and grains of sea salt to provide just the right briny flavour. Not on the regular menu, it was quite a treat. I had originally intended to have the blanquette de veau, but when I saw what was being offered as a Special for the day, I changed my mind instantly. After my disappointing experience with sweetbreads in France, I was desperate to try some Singaporean offerings, especially after Chubby Hubby's mouth-watering recipe. When it arrived, I was less than impressed with the string beans that were served as an accompaniment, along with the ubiquitous (but delicious) mashed potatoes, I noted with interest that the sweetbreads were much smaller than the ones I had in France, and came served with a rich, dark sauce. I was ecstatic to find that Sebastien's sweetbreads (er, not his, of course) were exactly as I had remembered them in London; small morsels that melt in your mouth with the effortlessness of fine chocolate. 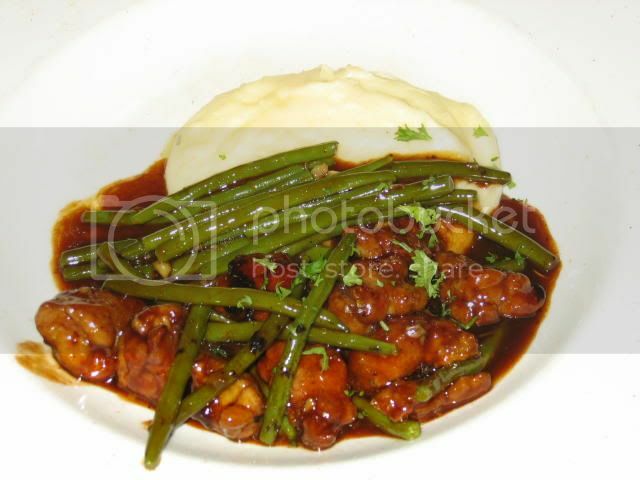 The sauce too, was lush, almost velvety, a veal and red wine reduction, sweet and piquant by the addition of garlic. I cannot recomment this dish ($26) enough to similarly adventurous souls; I only hope it makes it to Sebastien's regular menu (5/5). Dessert was a safe warm chocolate cake ($10), which was competent, if a little in need of more icing sugar. My only complaint was that it wasn't quite hot enough, which made it almost room-temperature when eaten with the vanilla ice cream (4/5). Yes, I really do like weekends. It does appear as if the new trend is for restaurants to remove themselves from the traditional confines of hotels and locations in the city and relocate to more residential areas in Bukit Timah and Holland Road. One of the latest offerings is Valentino's, a neighbourhood Italian eatery very much in the vein of Cantina and La Braceria, located off Rifle Range Road. 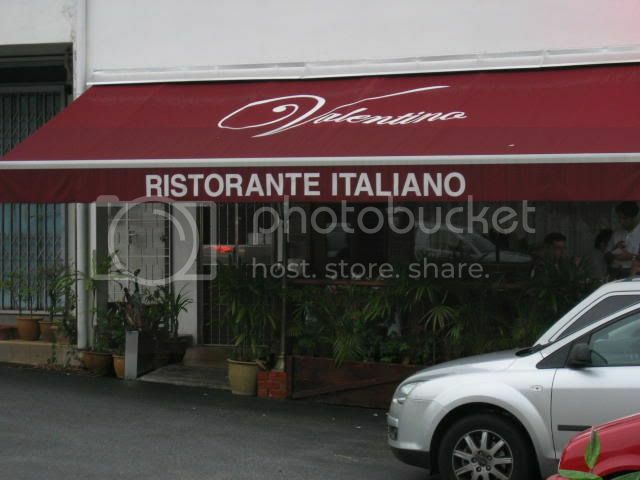 Valentino's facade is modest, almost humble, and only the maroon awning gives it away as a restaurant. That, and the fact that had I not made a reservation, we almost certainly would not have got a table. 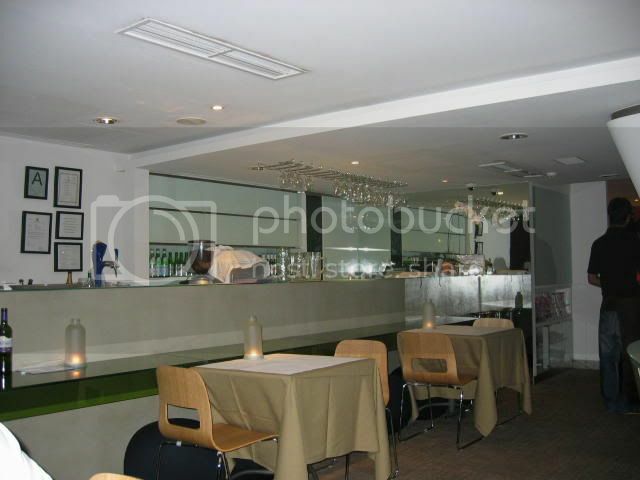 The interior of the restaurant is very homely, all earth hues and pictures of Maseratis, Ferraris and Lamborghinis. Also, a significant proportion of the staff is Italian, leading me to believe that Valentino must have imported his entire family over from Italy to help him run the place. Michele had the penne in spicy tomato sauce, whose pretentious Italian name I can't remember off-hand, but I do remember thinking that it was quite good. 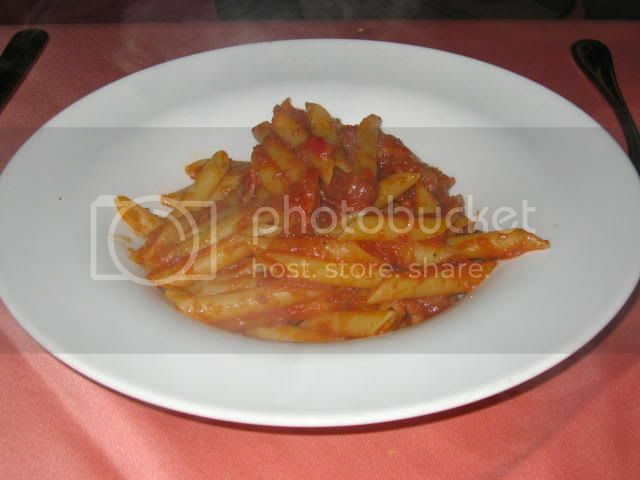 The pasta was fresh and homemade, with just enough of the piquant sauce to give the dish sufficient body and kick. 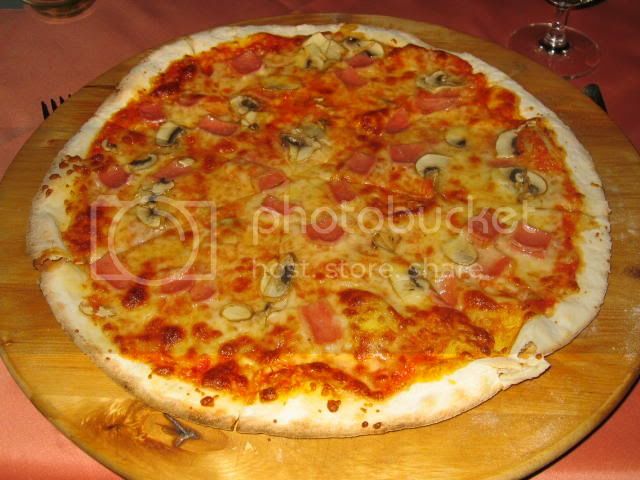 Valentino offers a lot of pizza; nothing exceptionally jaw-droppingly original, but once the pizza is brought out on a specialised revolving circular wooden board, you know the chef really knows what he's doing with pizzas. I had the Prosciutto e Funghi ($17) - the default option - and it is quite possibly the thinnest pizza I've ever had. Truly wafer thin, it was a delight to eat; my only gripe being that the toppings the pizza was adorned with were rather skimpy (3.5/5). 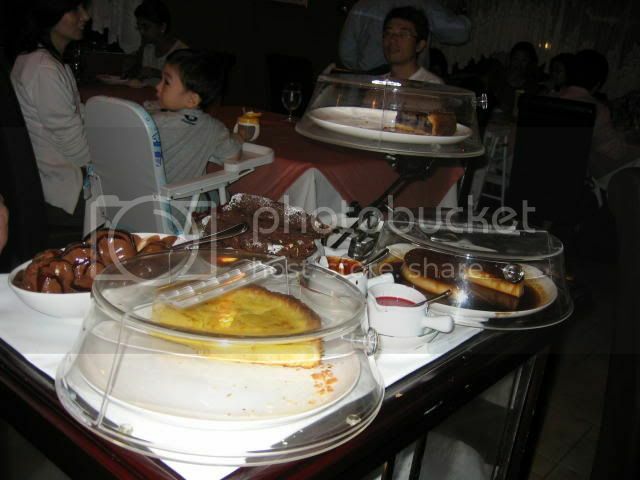 I've never seen a dessert trolley in an Italian restaurant before. This novelty amused me greatly, and it helped that the Italian guy explaining the desserts to us was very humourous. He described the chocolate salami as "I know it doesn't look very appetising, but it's very good". 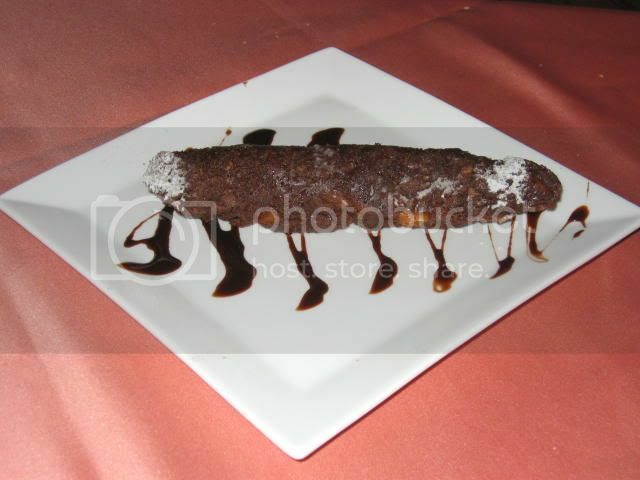 Personally I thought it looked like a rather phallic chocolate cookie, which it was, too, but I guess that made it all the more interesting. I decided to have the tiramisu ($9), again, the default option. 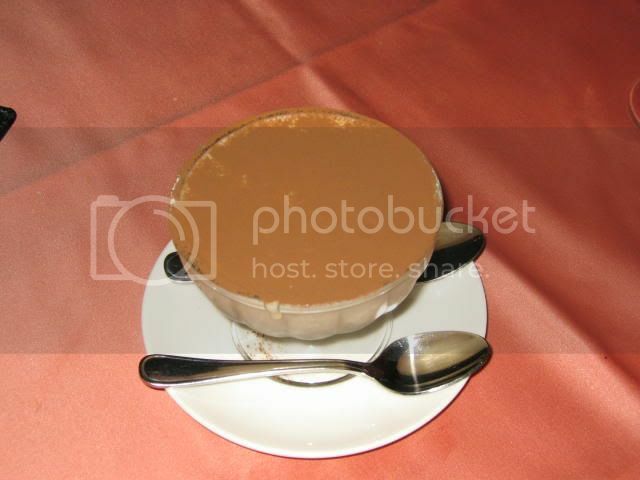 Now, if an Italian restaurant can't make a decent tiramisu, something is seriously wrong. Thankfully, Valentino can make a decent tiramisu. A bit rich on the mascarpone, but delectable nonetheless (4/5). 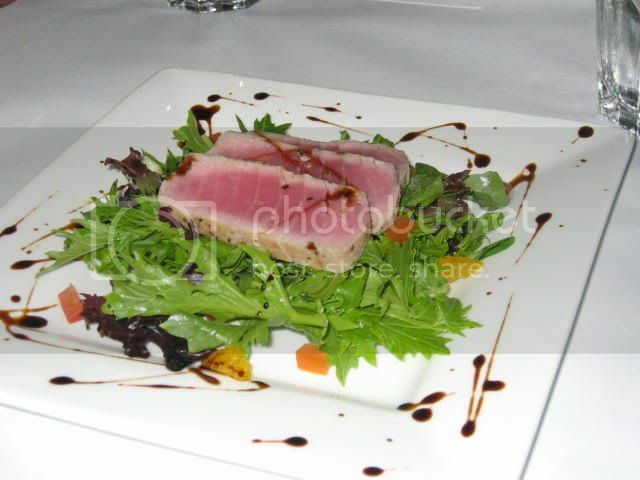 Valentino isn't a large establishment, and it gets full very quickly, so it's advisable to make a reservation. 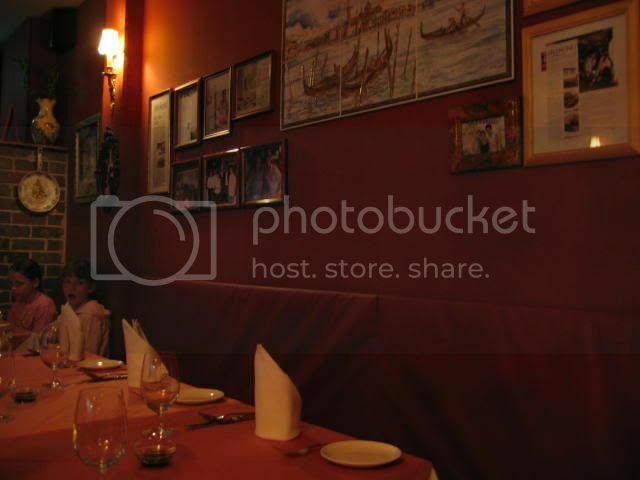 Cosy and comfortable, the restaurant attracts many families that come to have a nice dinner together. In terms of service, the familial Italian warmth really shines through. From what could have very well been the genial Italian father to the tongue-in-cheek Italian brother, you're never deprived of genuine service. 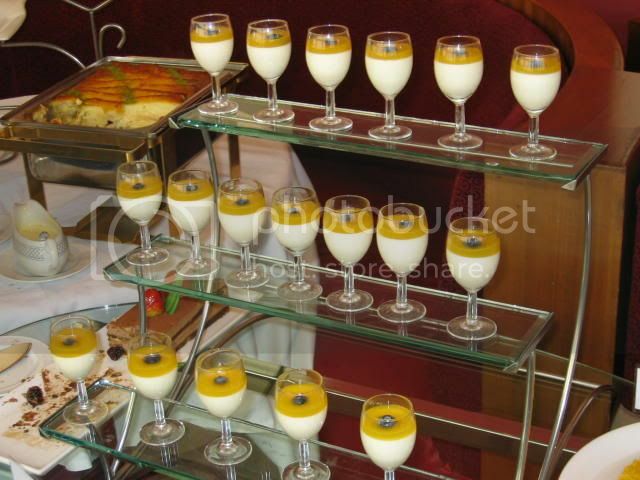 We were even provided two sets of dessert utensils without even having to ask. Overall: Italian food the whole family can enjoy. Try the pizzas. 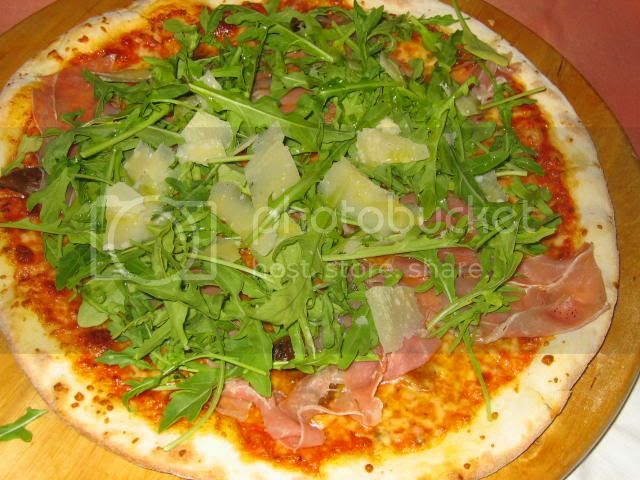 I had another pizza, this time one with rocket, parma ham and porcini ($25). Unlike my first pizza, this one had a generous heap of ingredients, but I would have preferred less rocket, and more of everything else. Zhixiong had what I think was called a Pizza Bismarck ($22), which was basically tomato, cheese and egg. 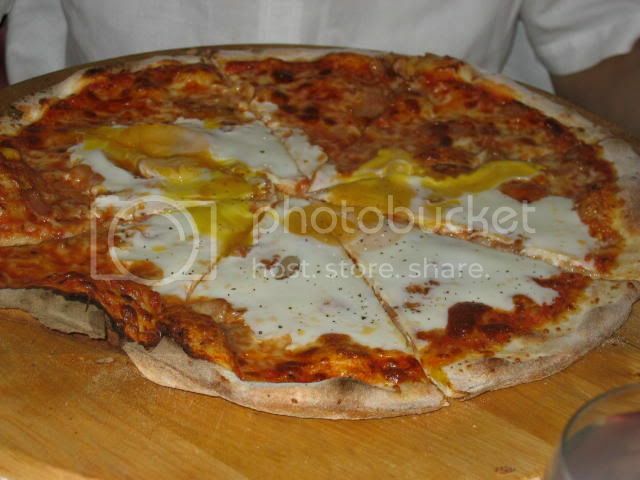 It was okay, I guess, since I'm not really that fond of eggs in my pizza. Now this was something else again. 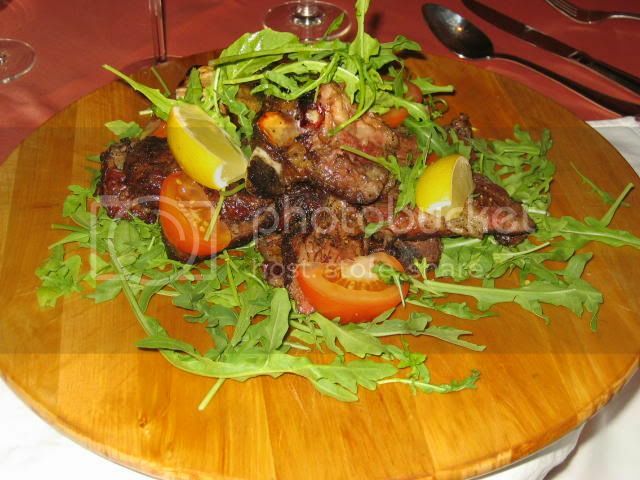 A Special of the Day, 850g of meaty Italian goodness. This is some serious meat, and I suspect it has to be shared among at least two people, if not three. Aaron, of course, was more than happy to take it on all by himself. See how happy he looks? 850g of meat is a very tall order though, and even the mighty Aaron had trouble finishing all that steak. Dessert took the form of panna cotta ($10) and creme caramel ($10), which were okay but not fantastic. The creme in particular seemed a bit dry and unpalatable. 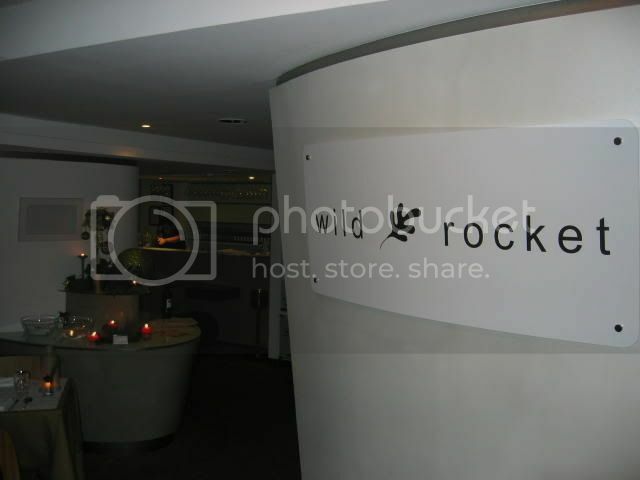 Wild Rocket is a new restaurant (slightly over three months now) that has enjoyed a fair amount of publicity in food blogs and the food section of the local papers. Judging from the number of patrons, owner-chef Willin Low is certainly right when he says it "pays to be a media whore". Wild Rocket is tucked away in Hangout Hotel at Mount Emily, possibly one of the most remote areas to start a restaurant, but there were a considerable number of intrepid diners, including ourselves, for whom the distance and location were no problem. The restaurant boasts one of the nicest interiors I've seen in a while, not stark and modernist, nor stodgy and conformist. The effect of the layout and lighting was muted at dinner time, but pleasurable nonetheless, so I imagine it would look fantastic at lunch time. 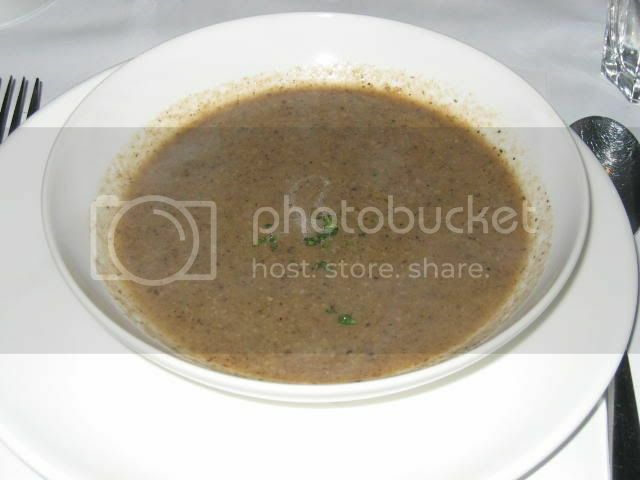 I decided to go for the mushroom soup ($8) as an appetiser, and regretted that decision as soon as the soup arrived. I would like to give the restaurant the benefit of the doubt and say that there's no way they would use MSG in their soup, but I can think of no other explanation for the incredible saltiness and throat-itching spiciness of their soup, totally overpowering any mushroom flavour that might have been present. Perhaps the stock they were using was a high-sodium variety. Whatever the reason, the soup was quite unpleasant (2/5). My sister changed her order from a mushroom soup to a tuna salad, which was apparently as good as it looked. Sometimes it pays to be adventurous. Thankfully, my main course of Braised Veal Cheek Penne with Green Peppercorns ($17.50) really shone through (4/5), restoring my pleasant dining experience. 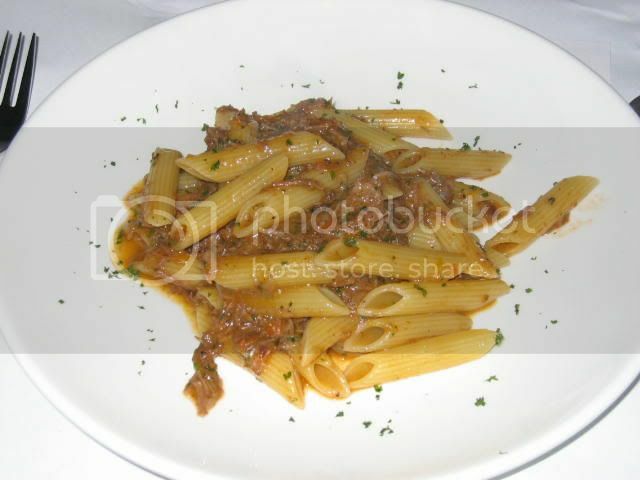 The veal cheek was braised to disintegration, and the rich, full-bodied sauce blended well with the chunky penne to produce a main course both tasty and filling. 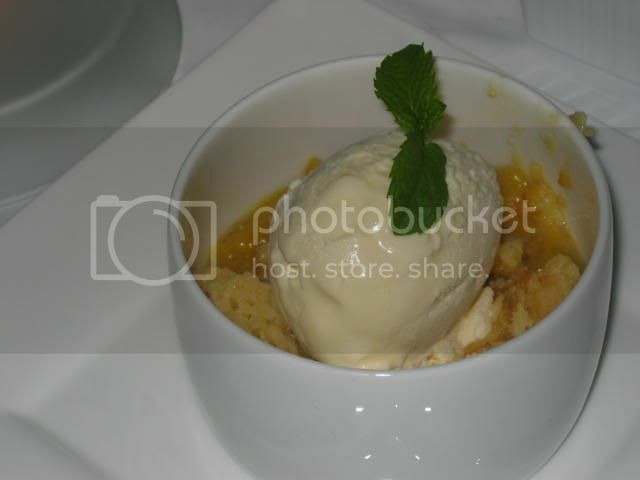 Dessert was a shared Mango Crumble ($10) served with vanilla ice cream, which was an interesting concoction (3/5), but I thought wasn't quite complex enough in its tastes, as both the mango and vanilla were sweet. Texturally, though, there was a nice contrast between the rich smoothness of the mango and the coarseness of the crumble. 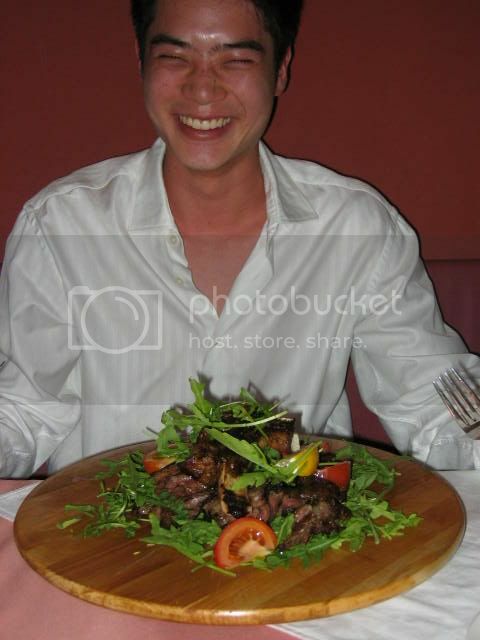 Service was earnest enough, with us rarely wanting for a waiter, and received a boost when Willin emerged from the kitchen to have a chat with us. For a three month old restaurant, Wild Rocket seems to be doing pretty well for itself. Overall: Wild Rocket's still finding its feet, but is a good option for a quiet dinner at refreshing new eatery.